Witch Skincare have been my go to brand for fighting spots since I was a young teenager and started suffering from some pretty bad outbreaks, I've tried multiple different brands and their spot cream offerings but I always come back to my faithful Witch products. A few months ago I was lucky enough to win this Overnight Clearing Serum in a twitter competition and I've been using it religiously paired with the Blemish Gel. The Blemish Gel is my go to spot fighting treatment, I've found nothing that works as well as this at clearing up spots quickly, depending on how bad the breakout is I can see a visible reduction with just one use of this gel. For me the best thing about this gel is it's consistency, it is definitely a gel consistency but it sinks in to the skin quickly and doesn't leave a tacky feeling. Its also one of the only spot treatments I've found that sits nicely under makeup, I like that I can put this on any problem areas before applying makeup and know that my skin is a little bit more protected and it stops my skin getting aggravated and more spotty from the makeup. At night I like to use slightly heavier products that will work overnight to improve my skin. The Overnight Clearing Serum has made its way up to the top with the Blemish Gel of products I always need to have! This stuff is amazing, it has done wonders at cleaning up my skin, it reduces spots quickly but feels moisturising and nourishing unlike some spot fighting products that can dry the skin out. 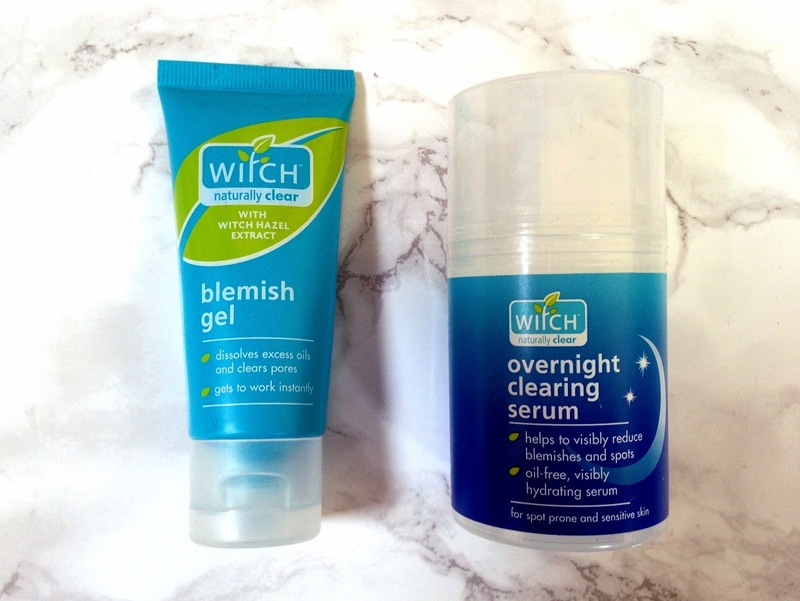 The witch hazel in both of these products gives it a distinct smell, but its not unpleasant, and I feel the inclusion of a natural product helps to keep your skin healthy as well as clearing up any blemishes. Together these products are my Spot Fighting Dream Team. I still get breakouts but these products help reduce them quickly. I've been using these products along with my Blemish Cleansing Moisturiser and I couldn't recommend them enough if you're suffering from spot prone skin or breakouts. Have you tried anything from Witch Skincare? Whats your go to spot fighting product?